It’s been some time since I did a results post, but the past 2 PPV’s haven’t gone well for me in that my internet connection decided it didn’t want to work on the night of Wrestlemania leaving me unable to watch it. And Extreme rules I was on holiday so again unable to view. 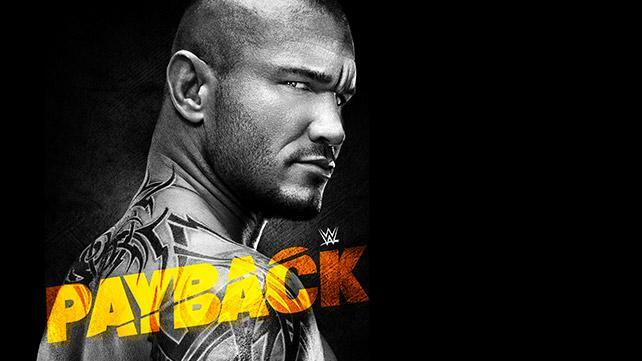 However, It’s a day late, but here we are with the results for WWE Payback 2015. Sheamus is currently rocking his heel persona. His backstage and interview segments are actually entertaining and he portrays a smug big guy incredibly well. This was a rematch from Extreme rules albeit this wasn’t a “Kiss me arse match”. It was however very entertaining with momentum switching between both wrestlers. Ziggler still massively popular with the WWE universe had the majority of the crowd chants. And the match for quite a spell saw Ziggler in control. Sheamus had his spell focusing on Zigglers knee to slow him down. The match ended with Ziggler headbutting Sheamus but seemingly damaging himself by this. Somehow cutting himself badly, his face covered in blood akin to Ric Flair back in the day. Sheamus followed this with a brogue kick to win clean. Good match to start the show. This was one awesome match. New Day are pretty ridiculous but they were also impressive on this display. Cesaro and Kidd are also looking incredible. The match had numerous great spots. Big E spearing Cesaro from the ring pretty early into the match was great. The first pinfall went the way of Cesaro and Kidd as Cesaro did his swing with Kidd delivering a drop kick from the top rope once the swing was complete. Kidd was left on his own for a spell in the match as Cesaro recovered from the spear off the ring that Big E delivered. New day hit their own double team move to even the score to 1-1. Cesaro attempted to slam Big E but had trouble getting him set up, so bailed on the move, which I think was pretty good. It avoided Cesaro making a botch and potentially stopped any injury Big E may have suffered had the move been done incorrectly. But that didn’t mean Cesaro couldn’t show off his strength holding Kofi in the air for a good 30 seconds as Kidd again climbed the ropes and jumped into Kofi slamming him to the ring. The pace of the match picked up and Xavier Woods sneaked into the ring pretending to be Kofi to roll up Kidd for the crafty win. All round was a great tag match. Another feud to keep Ryback and Wyatt relevant. I’ve not really been following this build up as I’m not particularly fond of Ryback. I’d like to see Bray thrown into other feuds with people that are relevant, like get him involved in the IC picture, or maybe try throwing him up against Rollins with Ambrose and Reigns. But that’s neither here nor there. Anyways, the match itself was average. Ryback using a frog splash on Bray was something pretty cool. But he injured his ribs in the process. Bray capitalized on this and exposed the metal on the turnbuckles slamming Ryback into them on his injured ribs. This was followed up with a sister Abigail and a pretty big win for Bray to get him back on track. So this is the 4th PPV in which these 2 guys have met and clashed over the US Title, and hopefully the end to it. Not that the matches have been bad. In fairness these matches on the PPV’s past have been the more entertaining ones. And this was the same case for Payback. The match started with Rusev very much in control asking the ref to ask Cena if he’ll quit? Cena responding no on each ask. The crowd chanting for Lana had Rusev distracted which let Cena get back into the match. The action went outside with Rusev hurling Cena into the ring steps. The steps were then brought into the ring and again Rusev throwing Cena into them left them dented. Cena responded by slamming Rusev onto them which was the start of the Cena-nation comeback. The action went back out ringside with Cena spearing Rusev through the guard rail. It then went on through the technical area with tv monitors and laptops being used as weapons. One table spot went horribly wrong as it failed to break from Rusev slamming Cena through it, So take 2, they re-set the table up in another position and Rusev just about slammed Cena through it. The brawl moved onto the titantron and Cena slammed Rusev into the pyrotechnics area causing fireworks and flames to hit. Back into the ring Rusev got Cena into the accolade and Cena passed out. Rusev celebrating as if he’d won was told that Cena hadn’t quit and the match was still on. He revived Cena by throwing water on him, only to be put into the STF and eventually in Bulgarian screaming that he quit. Lana did the translating and the ref stopped it. Excellent match. But the end of Lana and Rusev will follow. Not to bad. Brie took a hell of a kick to the face. Naomi and Tamina looked good. Expecting Naomi to be pushed to the Diva’s title next and certainly looked credible for it. Really happy to see Neville so high on the card for a PPV after only debuting on the main roster a month ago. And certainly took his moment to look good. He’s the high flying quick guy the roster has needed for a while. And him and Barrett can certainly put on a good show together. This won’t be the end of this feud though as King Barrett let himself get counted out to had Neville a victory. With Neville a little distraught at his win being so cheap, he let his guard down and Barrett returned to the ring to pummel Neville. However he got his revenge though as Barrett was celebrating in his king attire, he attacked him and hit the ever impressive Red Arrow. WOW what a main event this was.Right from the start J&J Security played a part causing carnage leading to separate brawls all around the ring. No one really had the upper hand until Reigns and Ambrose started working together. The duo soon had help from the 3rd ex Shield Member in Rollins as they triple power bombed Orton through the table for a brief Shield reunion that had the crowd going nuts. Myself included, I was officially marking out while watching with my friends. Seth Rollins celebrated and put his fist out to instigate a Shield fist bump. 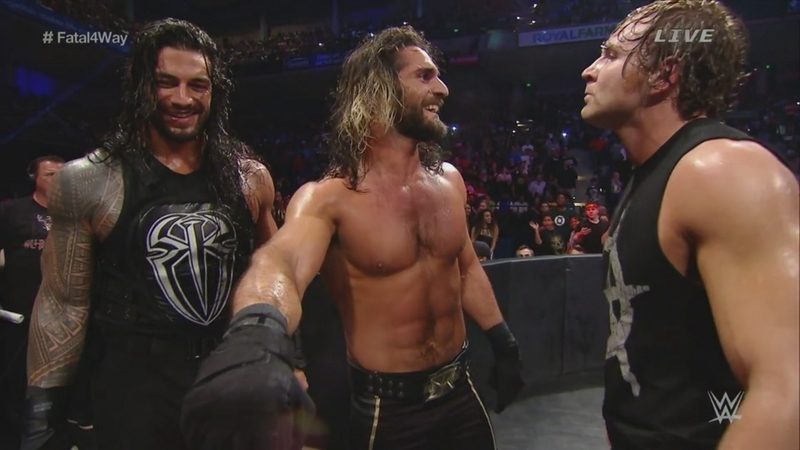 Ambrose and Reigns sarcastically looking and laughing with him. The tone turned serious and Ambrose and Reigns teamed up to put Rollins through a table on top of Kane. Then another awesome moment was Reigns and Ambrose realizing that between them they’d cleared their opponents. A friendly exchange between them about “not much else to do” and “Loser buying the beers” turned these 2 against each other in ring with some excellent too and fro between them. Rollins revived stopped a near count for Ambrose. Randy Orton got some great crowd response throwing RKO’s to JJ Security and to Kane. Rollins though got to put a pedigree onto Orton and picked up the win. A little deflated by that end as the pedigree was unfortunately terrible. But still a great main event and Ambrose and Reigns looked great. Get a Shield triple threat title match on again please. Brilliant match. And props to Orton, He was an unexpected bright point in the match too with the RKO’s, the table spot and taking the loss. ← Need For Speed Underground 3 to be revealed 21st May?